We are known for the production, supply and export of Polished Pebbles in India and across the globe. We offer Polished Pebbles at competitive prices. The range of Polished Pebbles that we offer is designed to be exquisite and beautiful. This range of Polished Pebbles includes Agate Polished Pebbles and Red Carnelian Polished Pebbles. 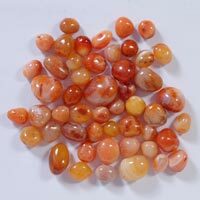 Our company is a Manufacturer, Supplier and Exporter of a highly demanded range of Red Carnelian Polished Pebbles. The range of Red Carnelian Polished Pebbles supplied by is manufactured using premium quality material and techniques. The company offers Red Carnelian Polished Pebbles at competitive prices.